Hi There. 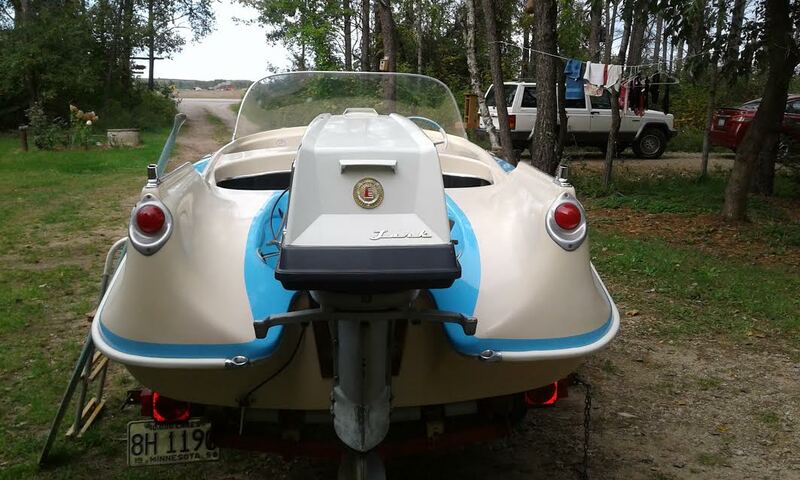 I have an original 1958 Larson 14 ft Thunderhawk, with the original Evinrude Lark 35 Golden Jubilee motor. On the dash of my boat there is an Evinrude golden jubilee emblem where you start the motor. My boat runs perfect. I can not find a serial number on the hull of the boat. I have the original paddle, latter, and canopy. The canopy is moldy and has some holes, but that can be replaced all the lights work as well as the lighted tubes that go near the back of the boat and carry American flags, and the original flag and wood post that are put on the front of the boat. I do have the original cushions, but they have some small tears, that I could easily sow. I even have the original prop, but I hit a rock with it so it's not on the boat any more. I just can't seem to find out much information on my boat. I see lots of 1957's and 1959's mostly restored and red and white new motors etc. Mine is baby blue and white. I know that in 1958 the hull/fiberglass construction was changed to a lighter and it was molded so that the hull was one full piece. I have an article that say's, Larson started to get national attention due in part that The Price is Right game show was buying The Thunderhawks to give away as prices. Please help. Is my boat in any way special or not.